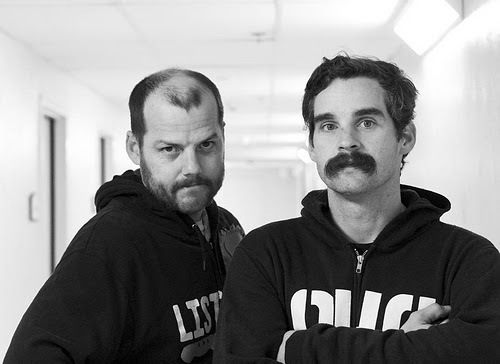 Dan Smith and Chris Nelson are Listener, a talk-music band where Dan does the talking and Chris plays the music. The first time I stumbled upon their music, I was quite confused to what was actually happening. Once I discovered that Dan talking was in fact the music I was greatly intrigued. Listener is something that will be forever unique and a refreshing take on the power of music in society. The enchanting words of Dan Smith can be soul crushing through both the depth of the lyrics and the passion in his voice. Whether it’s through the soft melody of “Wooden Heart” or the heavy guitar and presence of a trumpet in “These Hands Weren’t Meant For Us”, Listener crafts their music beautifully. Be sure to check out their website, along with my favorite song by them “You have never lived because you have never died”. First, could you state your name(s) and your band name? Listener: Dan Smith & Chris Nelson… the band is called Listener. Is there any meaning behind your band name? Listener: It’s a word that we all can share in, I guess. How did you come up with the idea to create talk music or spoken word? Listener: I used to be into and made hip-hop music when I was younger and then grew out of that, but what I took was the ability or interest in writing words in long form, and so when Chris and I got together and put our heads together that is what came out. Listener isn’t signed to a record label, what do you think about being independent versus being signed to a record label? I say go do what you love and if it makes sense to partner with someone do it… if it doesn’t, don’t do it. Listener: We aren’t signed to a record label. No one really has been interested too much in partnering with us in a way that makes sense, I guess I should say. Some bands see record labels as the only way they can get their music out and we are living in a world, as far as music goes, that’s just not the case anymore. It’s more work and it takes some figuring out and trial-and-error, but you can do it yourself… for a time. For some things I’m sure it would be good to have a label; some record labels have great track records and really are tastemakers in the world and put bands in a certain light that they can’t attain on their own. I guess a record label really is a publicity and distribution company that takes what the band makes at practice and in their lives, the music they make and play shows with, and tries to make it a larger than life thing and get it out there with their monies and influence. Some labels like to think they can own a spot in the life of a band for being a contributor and investor for a time. I think in the right light, a label should be just as important as the manager or booking agent and should be due their investment back and then perhaps a percentage of what a band makes on record sales thereafter for the life of a record, which is usually about a year or two. A lot of record labels want to be a member of the band, and a lot of times make half or more of what the band makes, and it’s just a gamble. I say go do what you love and if it makes sense to partner with someone do it… if it doesn’t, don’t do it. That’s sort of a long-winded answer, but it’s something I’ve been thinking about lately. What message do you hope to convey to your audience through your music? Listener: That life is going to be life and success and failure and perfection and loss and all the things that make life are important, and we get to make decisions to those ends and learn from them… that’s the beauty of life, to see beauty in the struggle and enjoy it all, and the joy that comes from that is a product of searching it out and not hiding or waiting for something magical to happen. What do your songs mean to you? Listener: The words I write are usually always just ideas and questions I have and things I see, and that’s just the way I go about it. Listener: Life… my family and friends. Your most recent album is Wooden Heart, is there any song on that album that you feel is some of your best material? Listener: I think the whole album is our best material. I’ve enjoyed playing it out on the road in front of friends and strangers. It’s been a blast. Any news on any new material? Listener: We are writing and making new music right now… this spring. Loving it. Chris just emailed me a tune today he wrote. I’ve been writing words and ideas down. I just need to sit down and comb them out and make it something I want to say. Listen: Red Hot Chili Peppers - "The Adventures of Rain Dance Maggie"